Department of Botany, Jnanabharathi Campus, Bangalore University, Bengaluru - 560056, Karnataka, India. ABSTRACT: The present study was aimed to develop the effective protocol for induction roots and in-vitro regenerated plants from embryo culture of Nothapodytes nimmoniana. Excised embryos were sterilized under the aseptic condition and cultured on L2 medium fortified with different concentration (0.5 - 3 mg/L) and the combination of auxins and cytokinins. Maximum shoot initiation was observed in BAP (2 mg/L) and Kin (1 mg/L) and in a combination of BAP (0.5 mg/L) and NAA (2 mg/L). A higher number of roots were observed when the embryo was inoculated on L2 medium supplemented with NAA (1 mg/L) and 2, 4-D (0.5 mg/L). Whereas, elongated roots were observed on L2 medium fortified with BAP/KIN (0.5 mg/L) and NAA (1 mg/L). 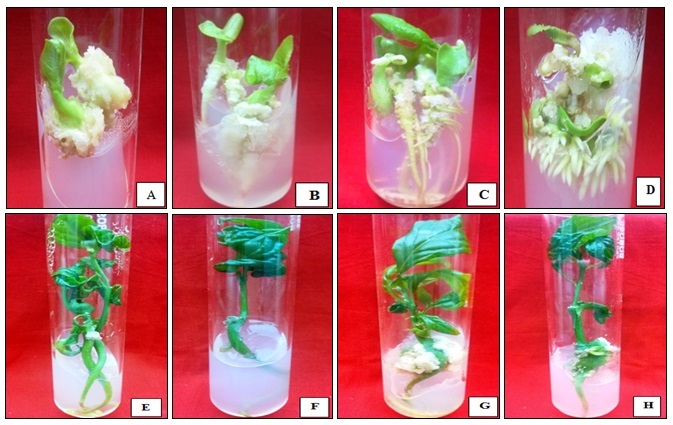 The proliferation of multiple shoots from the nodal explants of in-vitro plantlets, when sub-cultured on MS medium supplemented with BAP (2 mg/L), TZD (0.2 mg/L) and L-glutamine (100 mg/L). The obtained plantlets were hardened in soil-rite and then transferred them to a mixture of soil, sand, and manure (1:1:1). In conclusion, our study demonstrates the in-vitro root induction and regeneration of Nothapodytes nimmoniana. INTRODUCTION: Nothapodytes nimmoniana Graham (Syn. Mappiafoetida, N. foetida) which is commonly called a stinking tree belongs to the family Icacinaceae. It is a small evergreen tree, which is widely distributed and endemic to the Western Ghats, North East India, Srilanka, Myanmar and Thailand 1, 2. N. nimmoniana is an excellent source of cytotoxic quinolone alkaloids, camptothecin (CPT) and 9-methoxy camptothecin, which are the most promising anticancer drugs of 21st century 3. CPT was first isolated from Camptotheca acuminata by Wall et al., 4 later Govindachari and Viswanathan 5 in detected CPT in N. nimmoniana for the first time. The derivatives of water-soluble CPT are topotecan and irinotecan, which commercially exist for the treatment of solid tumors. CPT is a potent topoisomerase inhibitor that interferes with the essential function of topoisomerase in DNA replication. CPT is also therapeutically used in the treatment of anti-malarial drug, anemia, antibacterial, antifungal and anti-inflammatory 6, 7, 8. Due to its wide range of pharmaceutical use, it has been exploited naturally. According to World Bank (1997) report, the twigs of this tree available for Rs. 9/kg in India, whereas pharmaceutical industries sell the processed plant extracts for US$ 15000/kg in the world market 9. It is reported that N. nimmoniana has highest CPT among all other plants, hence to meet its clinical demands it has been overexploited. Over 50-80% of the population has been vanishing from the Western Ghats of India and has been declared as an endangered species 10, 11. 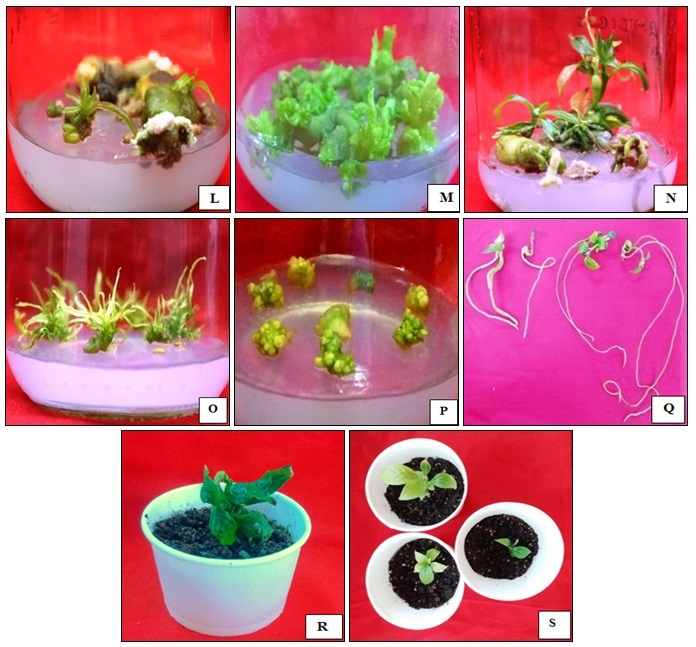 Various workers have been reported on in-vitro propagation of N. nimmoniana. Among various tissues analyzed, the root bark yielded the highest CPT content followed by stem bark and root 12. In tree species, seed germination is very low due to hard seed coat and dormant embryos. The present study is to investigate the efficient protocol for embryo culture, in-vitro propagation, and induction of roots of N. nimmoniana. MATERIAL AND METHODS: Mature seeds and seedlings of N. nimmoniana were collected from Mahabaleshwar, Maharashtra, and Ooty, Tamil Nadu, India during January and February. The seeds were shade dried and stored in the refrigerator in airtight container for further studies. The plant materials were authenticated (Voucher no. BUB-2272) and the seedlings were maintained in the greenhouse condition Department of Botany, Bangalore University, Bengaluru. Embryo Culture: The outer epicarp was decorated by soaking in water for 24 h and seeds were disinfected with bavastin and then washed in running tap water for 15-20 min, again they were surface sterilized with teepol for 5-10 min and washed thoroughly with tap water to remove traces of detergent followed by sterile distilled water wash. The seeds were sterilized with 0.1% mercuric chloride for 5 min, followed by a 4-5 wash in deionized water. Embryos were dissected aseptically from seed and inoculated on L2 medium 13 and MS medium 14 containing 3% sucrose, 0.8% agar and pH of 5.6 to 5.8, supplemented with different concentration and combination of auxins such as NAA (Naphthalene acetic acid), IBA (Indole-3-butyric acid), IAA (Indole-3-acetic acid), 2,4-D (2, 4-Dichloro-phenoxyacetic acid) and cytokinins like BAP (6-benzyl aminopurine) and Kin (Kinetin). Cultures were maintained in standard culture condition provided 25 ± 2 ºC temperature and 16/8 h photoperiod with cool fluorescent light (4000lux/m). 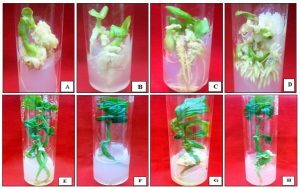 Sub-culture: Node and internodal explants were sub-cultured on MS and L2 medium supplemented with different concentration and the combination of auxins and cytokinins for multiplication of shoots. For induction of somatic embryos, node and internodal region were inoculated on L2 medium fortified with a combination of BAP and IBA. Further multiplication of embryos, the nodal region was transferred to MS medium fortified with a combination of BAP and 2, 4-D/TZD. Hardening: Regenerated plants with well-developed roots were removed from the medium and washed thoroughly in tap water to remove traces of agar and transferred to soil-rite (Keltech energies Ltd., Bangalore) and then covered by the polythene bag with 3-4 holes for aeration to maintain 80-90% humidity and kept in the culture room for 15-20 days. Later the plantlets were transferred to pots and maintained in the greenhouse condition. Statistical Analysis: The data were expressed as Mean ± SD. All the experiments were repeated thrice, and 15 replicates for each experiment. RESULTS AND DISCUSSION: Mature zygotic embryos of N. nimmoniana were cultured on L2 and MS medium containing various concentration and the combination of auxins and cytokinins. L2 medium was found to be the best regarding complete regeneration of plants after 8-10 w of culture. The significant changes were observed on L2 medium fortified with different auxins and its combinations. The L2 medium supplemented with a lower concentration of auxins (0.1 -1 mg/L) showed maximum root induction. Whereas, initiation of roots were observed in the higher concentration of auxins and there was no further development of roots even after 8 w of an old culture. Similar observation was reported by Devendra et al., 15 in Zingiber roseum, when zygotic embryos were cultured on medium containing 2.68 µM of NAA with an efficiency of 95.4 % root induction compared to higher concentration. Hemadri Reddy 16 reported that L2 medium was better than MS medium regarding shoot multiplication and shoot length in Asclepias curassavica. FIG. 1 A-H: EFFECT OF GROWTH REGULATORS ON ZYGOTIC EMBRYOS OF N. NIMMONIANA ON L2 MEDIUM. A- 2,4-D (1 mg/L), B- IBA (0.5 mg/L), C- NAA (1 mg/L), D- 2,4-D (0.5 mg/L) + NAA (1 mg/L), E-BAP (2 mg/L), F-Kin (1 mg/L), G-BAP (0.5 mg/L) + NAA (2 mg/L), H- Kin (0.5 mg/L) + NAA (2 mg/L). FIG. 2 L-P: EFFECT OF GROWTH REGULATORS ON INDUCTION OF SOMATIC EMBRYOS AND SHOOT REGENERATION FROM NODE AND INTERNODE. L-L2 + BAP (1 mg/L) + TDZ (0.2 mg/L) + NAA (0.5 mg/L), M-L2 + BAP (2 mg/L) + TDZ (0.2 mg/L) + GA3 (2 mg/L), N- L2 + BAP (0.5 mg/L) + IAA (1 mg/L), O-L2 + BAP (2 mg/L) + TDZ (0.2 mg/L), P-MS + BAP (1 mg/L) + 2,4-D (1 mg/L), Q- Measurement of root length, R & S- Hardening. Induction of somatic embryoids and development of multiple shoots were observed after sub-culturing of node and internode from in-vitro regenerated plants Fig. 2 L-O. When the proliferated buds were transferred to medium containing BAP (2 mg/L), TZD (0.2 mg/L), GA3 (2mg/L) and L-Glutamine (100 mg/L) showed significant shoot elongation up to 3-4 cm after 12-14 w of culture. A maximum number of somatic embryoids were induced on MS medium fortified with combinations of BAP (1 mg/L) and 2, 4-D (1mg/L) after 14 w of culture Fig. 2P. Similar results were reported by Tejavathi et al., 20, 21 from embryos of N. foetida cultured on L2 medium fortified with a lower concentration of TZD. Complete regenerated plants were observed on L2 medium supplemented with BAP (0.5 mg/L) and NAA (2 mg/L) with slight callus induction on the transition zone of primary root and hypocotyls. The well-developed rooted plantlets were carefully washed in sterile distilled water to remove the traces of agar, then they were transferred to small polythene cups containing soil-rite and maintained in the hardening chamber. After 15 d the plantlets were transferred to pots containing soil, sand, and manure (1:1:1) Fig. 2 Q-S. CONCLUSION: In the present study, we developed the efficient protocol for in-vitro mass propagation of N. nimmoniana through direct regeneration of plantlets from embryo culture. L2 medium was found to be better for shoot multiplication. A lower concentration of BAP and NAA resulted in better root induction. Development of somatic embryoids and multiple shoots was achieved with lower concentrations of cytokinins. The developed protocol may be useful for in-vitro regeneration of N. nimmoniana which prevents the exploitation of this plant from natural habitat. ACKNOWLEDGEMENT: The authors are thankful to the Department of Science and Technology (DST-SERB), New Delhi for providing financial assistance. Karehed J: Trees of tropical Asia old Icacinaceae. Am J Bot 2001; 88: 2259-2274. Gowda HC, Vasudeva R, Georgi PM, Uma SR, and Ganeshaiah KN: Breeding types in nimmoniana Graham. Current Science 2002; 83: 1077-1078. Li SY and Adair KT: Camptotheca acuminataDecaisne XI SHU ³ß¾ð (Chinese Happy tree) a promising anti-tumor and anti-viral tree for the 21st Texas: The Tucker Center College of Forestry Stephen F. Austin State University Nacogdoches 1994. Wall ME, Wani MC, Cook CE, Palmer KH, Mc.Phail AT and Sim GA: Plant antitumor agents I. The isolation and structure of camptothecin, a novel alkaloidal leukemia and tumor inhibitor from Camptotheca acuminata. Journal of the American Chemical Society 1966; 88: 3888-3890. Govindachari TR and Viswanathan N: Alkaloids of Mappiafoetida. Phytochemistry 1972; 11(12): 3529. Bodley AL and Shapiro TA: Molecular and cytotoxic effects of camptothecin, a topoisomerase I inhibitor, on trypanosomes and Leishmania. Proc. Natl Acad Sci, USA 1998; 92: 3726-3730. Kumar R and Ved DK: 100 Red listed medicinal plants of conservation concern in Southern India. FRLHT, Bangalore 2000; 261-263. Sheeja E, Edwin E, Dhanbal S and Suresh B: Anti-inflammatory activity of the leaves of Nothapodytes foetida Indian J Pharm Sci 2005; 67(2): 251-253. Rai R: Rapid clonal propagation of Nothapodytes foetida (Wight) Sleumer- A threatened medicinal tree. In-vitro Cell Dev Biol-Plant 2002; 38: 347-351. Anonymous: Conservation assessment and management plan for medicinal plants in Maharashtra state. Foundation for Revitalization of Local Health Traditions (FRLHT), Bangalore 2001. Ved DK: Trade in medicinal plants, the state of our ignorance. Amruth 1997; 1: 2-8. Padmanabha BV, Chandrashekar M, Ramesha BT, Hombe Gowda HC, Gunaga RP, Suhas S, Vasudeva R, Ganeshaiah KN and Uma Shanker R: Pattern of accumulation of camptothecin, an anticancer alkaloid in Nothapodytes nimmoniana Graham in the Western Ghats, India: Implications for identifying high yielding sources of alkaloid. Current Science 2006; 90(1): 95-99. Murashige T and Skoog F: A revised medium for rapid growth and bioassay with tobacco tissue cultures. Physiol Planta 1962; 15: 473-497. Devendra BN, Swarnalatha P and Srinivas N: An efficient multiple shoots induction from zygotic embryos and rhizomes of roseum Rosc. An endangered medicinal plant. 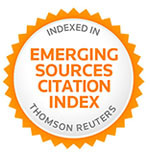 Annals of Biological Research 2011; 2(5): 329-337. Hemadri Reddy S, ChakravarthiM, Chandrashekara KN and Naidu CV: Effect of MS and L2 Medium on callusing and regeneration from nodal explants of Asclepias curassavica (L). 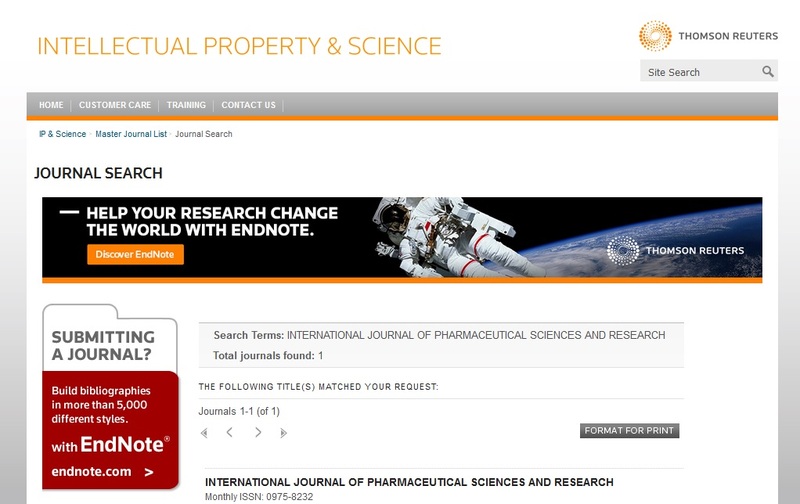 International Journal of Engineering Research and Applications 2013; 3(1): 294-301. Pranati Nayak PR, Behera and Manikkannan TK: High-frequency plantlet regeneration from cotyledonary node cultures of Aegle marmelos (L.) Corr. In-vitro Cell Dev Biol Plant 2007; 43: 231-236. Kaveri S and Srinath Rao: In-vitro seed germination and embryo culture in Nothapodytes foetida (Wight) Sleumer. International Letters of Natural Sciences 2015; 48: 23-31. Pandey P, Mehta R and Upadhyay R: In-vitro propagation of an endangered medicinal plant Psoralea corylifolia Asian Journal of Pharmaceutical and Clinical Research 2013; 6(3): 115-118. Tejavathi DH, Raveesha HR and Shobha K: Organo-genesis from the culture of Nothapodytes foetida (Wight) Sleumer raised on TZD supplemented media. Indian Journal of Biotechnology 2012; 11: 205-209. Kaveri S and Srinath R: Thidiazuron mediated callus and multiple shoot induction in Nothapodytes foetida an important medicinal plant. Int J Adv Res 2017; 6(1): 1731-1734. Raveesha HR and Vasudha DR: Induction of roots and in-vitro regeneration of Nothapodytes nimmoniana Graham from embryo cultures. Int J Pharm Sci & Res 2019; 10(2): 830-35. doi: 10.13040/IJPSR.0975-8232.10(2).830-35. Authors Address: Department of Botany, Jnanabharathi Campus, Bangalore University, Bengaluru, Karnataka, India.